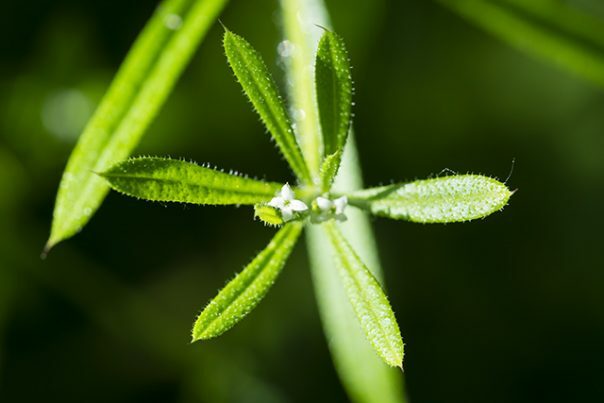 Cleavers, which has the scientific name Galium aparine, has been known in many other names such as barweed, catchweed, goosegrass, sticky Willy, and zhu yang yang. It has a reputation for being used as a medicinal herb by herbologists. Cleavers is widely cultivated in France, Mexico, Australia, Britain, China, Iraq, Spain, Turkey, and the United States. It usually thrives in hedgerows, fields, and in the woods during temperate climates. It is a perennial that is a member of the Rubiaceae family. Cleavers has lance-shaped, narrow leaves that have a rough surface and are rough along the margins. Its flowers are star-like, tiny, and white, and grow in a stemmed bud that rises from the leaf axils and are arrange din clusters or whorls. Its seeds are little round vessels that cling to whatever they touch, ensuring their propagation. Cleavers blooms from April to September. Cleavers has alterative (restoring the proper function of the body by increasing health and vitality), anti-inflammatory, antiphlogistic (fever-reducing), aperient (relieving constipation), depurative (cleaning waste toxins from the body), febrifuge, tonic, and vulnerary (wound-healing) properties. Cleavers has diuretic properties, which means it stimulates urine production. This further facilitates the removal of toxins in the body, this is why cleavers can be used to treat eczema, psoriasis, and seborrhoea, which is a skin condition that is characterized by excessively oily skin due to increased sebum formation, reddish or irritated skin, and seriously itchy skin. Cleavers has antiseptic and astringent benefits, making it an effective wound and boil treatment. It is also said to remove freckles, acne, and age spots and treat sunburn. It provides for healthy, radiant-looking, and youthful skin. The prostaglandin content of cleavers can provide for blood vessel health. It enhances blood clotting and purifies the blood. Cleavers has cancer-fighting abilities. It is known to treat lumps in the breast and stave off the growth and proliferation of cancer tumors such as those of lung cancer. Cleavers has diaphoretic properties by aiding in perspiration stimulation, thereby cooling the body and reducing body temperature, which is good for lowering a fever and lessening the effects of viral infections like measles and chicken pox. Cleavers is good for the digestive system. It has a laxative efffect that can cause the purging of unwanted elements in the body. It can also address gastrointestinal issues such as ulcers and constipation. Cleavers is good for the lymphatic system. It can be used to address serious issues such as hepatitis, which is inflammation of the liver, and cystitis, which is some form of urinary tract infection. It can also address water retention and prevent lymphoma, or cancer of the lymphatic system. Cleavers is good for the respiratory system. It can be used to treat disorders such as glandular fever, which is characterized by a fever, extreme tiredness, sore throat, and swollen lymph nodes and glands, and tonsilitis. Cleavers is good for the female reproductive system. Its prostaglandin content can stimulate the uterus, thus providing for its proper function. Cleavers is good for the cardiovascular system. It aids in the prevention of atherosclerosis, heart ailments, and strokes. Cleavers is good for the immune system. Cleavers is a food source for the larvae of many butterfly species. Its root can be used to make red dyes. Cleavers can also be used to make medicinal tea. For best results, drink a cup of cleavers tea that is made up of two to three teaspoons of its powdered form for two to three times during the day. For more tips on how to make herbal medicinal concoctions out of cleavers, visit this site. Cleavers is good for the digestive, lymphatic, respiratory, cardiovascular, immune, and female reproductive systems. Cleavers can provide for blood vessel health. Cleavers can be used as antidote to poison.